William and Mary dropped a road game April 10 against George Washington by a final score of 8-4. It was a slow day for the Tribe’s offense, and the Colonials capitalized with a few strong offensive performance of their own. The first inning saw one such offensive showcase, as the Colonials immediately put runs on the board following a two-run double from infielder Dom D’Alessandro. D’Alessandro was just the beginning, and before the inning was over the Colonials had sent another runner home, making the score 3-0. The Tribe responded in the second inning with junior outfielder Brandon Raquet’s two-run home run. Raquet’s blast made the score 3-2 and put the College within striking distance of the lead; however, the following innings were quiet for both teams, with no further scoring until the fourth, owing to strong pitching from sophomore pitcher Jacob Haney on the mound for the Tribe. Haney faltered in the fourth however, giving up a solo home run to Colonials catcher Anthony Frechette that put the Tribe down by two. The College’s offense remained quiet, and Haney’s struggles allowed the Colonials to tack on three more runs in the fifth, making the score 6-2. Senior infielder Zach Pearson struck for the Tribe in the sixth with a well-hit double to left field that scored senior outfielder Owen Socher. The College was unable to continue Pearson’s momentum though, and the Tribe failed to score again until the ninth. The Colonials loaded the bases yet again in the bottom of the seventh and earned a run from a balk by junior pitcher Jamie Sara. They would score once more in the contest, earning eight total runs, but the Tribe refused to lay down, and there was light for the College in the top of the ninth. Junior first baseman Matthew Trehub and freshman infielder Hunter Hart followed up a single by Pearson with walks of their own to load the bases, and sophomore infielder Matt McDermott drew a walk after fouling off multiple pitches to extend his at-bat, sending Pearson home to make the score 8-4 in favor of the Colonials. The Tribe was persistent, managing to bring the tying run to the plate two separate times, but the College was unable to close, and the score remained 8-4 when freshman outfielder Jack Cone struck out to end the game. The loss can be traced directly back to an inconsistent offense paired with a sloppy outing on the mound for starter Haney, who is 3-3 on the season for the Tribe. 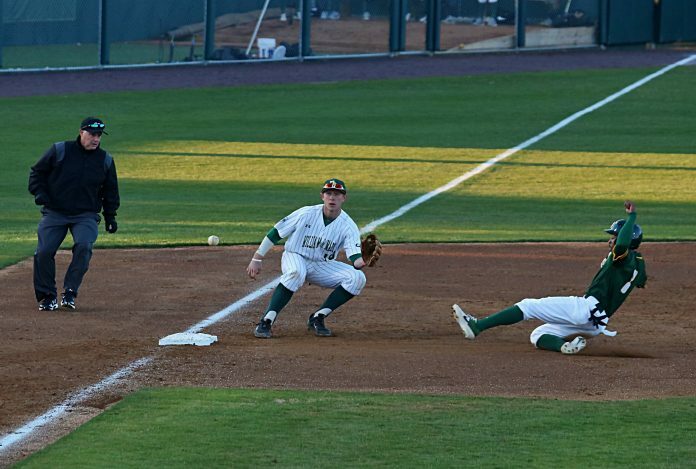 Additionally, the College stranded six runners on base over the course of the game. The most encouraging feature of the game was the bullpen; sophomore pitcher Randy Prosperi threw 1.2 innings of scoreless relief, including helping the Tribe out of a tense bases-loaded situation in the fifth. Prosperi has allowed only one run in his previous 13 innings pitched. The Tribe returns home to Plumeri Park April 12-14 to face James Madison; the College’s offense will need to make an appearance if it hopes to come away from the series with a win.